Well folks, I am back on my feet and running to keep up with Fr. Tom [Fr. Thomas Haggerty, Pastor at Sts. Philip and James Parish] and all the hope-filled things happening here at Sts. Philip and James Parish in St. James, NY. I had the privilege of hearing three different homilies and they all left me with much to think about. So, here are some of my thoughts on this week’s readings. The first reading from Wisdom could really dissuade one from being a good person. Yikes! Have you ever had the experience of trying to do good or make a situation better only to be accused of being a know-it-all or a goody-goody? Perhaps people have become jealous of your talents and created stumbling blocks for you? James writes, “Where jealousy and selfish ambition exist, there is disorder…” (James 3:16). I believe that all of us have had these experiences in some form. How do we handle these situations? Can we take the high road and remain faithful to the person God created us to be? We are in good company in our struggles. Just look at the life of Jesus! Then Mark’s Gospel gives us a bird’s eye view of the humanity of the Apostles. Jesus knew they were arguing about who was the greatest, the first among them. He was trying to teach them, instead, to be first in service to others. Placing a child “in their midst” is very telling because children were not even counted in their society. They were the lowest of the low. Jesus says, “Whoever receives one child such as this in my name, receives me…” (Mark 9:37). Talk about being humbled! This week spend some time reflecting on whether you are the accused or accuser. How do you handle the stumbling blocks in your life? Are you willing to be serve others first? Because of our humanity we will fail, at times, to do what is right and to continue to remain faithful. But, there is always hope. Make it a great week! 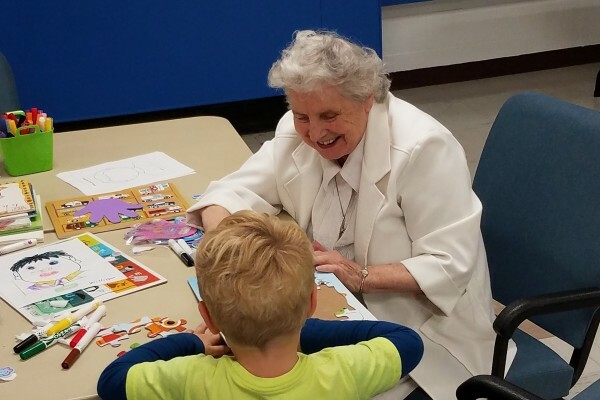 Pictured: Sr. Florence Klaniecki working with a student from Mount Nazareth Learning Center during the intergenerational program at The Community at Holy Family Manor in Pittsburgh.